We had luckily arrived in Lukla by plane about lunchtime after a four hour delay at Kathmandu airport. Outside our tea-hut were a few Dzopkyo (a cross between a cow and a yak). These beasts of burden are made use of at elevations below 3,400m, animals that the Sherpa people consider more valuable than a pure bred Yak. Yet they weren’t ours to appropriate; we had four personal porters who would each be lugging two of our 15 kilo bags. Two days earlier plenty of praying wheels where being spun in the hope the bad weather bomb that hit the surrounding villages would clear. It had stranded upwards of 2,000 hikers and closed the airport for six days. 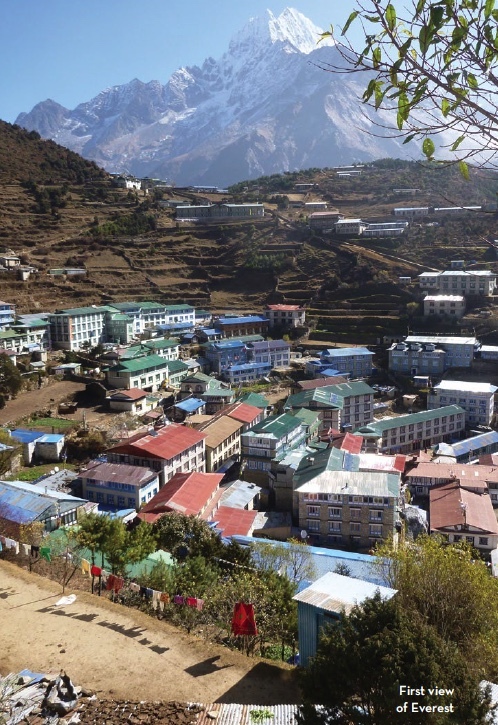 Located at 2,800m, Lukla only has a population of about 1,500 people but it’s the gateway and exit to and from the eastern Himalaya and the pinnacle of all mountains…Everest. After lunch we began our trek. Our first camp was about two hours away in the small village of Ghat at 2,600m. Here in a small parchment of field were eight bright orange permanently pitched two-man tents, four side-by-side composting toilets, as well as a cosy, kerosene lamp-lit dining and breakfast hut. By 4.30pm a golden eye of sun was setting behind snow-capped mountains and the scene was one of inspiration and self-indulgent delight. and potatoes. Our first meal consisted of a spicy soup, chicken curry, mixed vegetables, rice and a pineapple desert. The final end to the meal is always reserved for pouring boiling water into drinking bottles – which everyone soon learned, at this altitude, were best kept tucked away as hot water bottles in sleeping bags. Each morning started at 6am with a ‘tap, tap’ on our tent flap followed by hot tea poured from a big aluminium kettle. Fifteen minutes later hot water was distributed into bowls by the tent-flaps – our regular morning, wash and rinse basin. Once our camping gear was packed away, breakfast started about 7am, usually with a hot cordial drink, black tea, a bowl of porridge followed by a cooked breakfast. By 8am we were on the dusty trail, boot-legging it whilst trying to avoid freshly deposited dung as well as the sharp horns of passing Dzopkyo. Life on the trail was a constant progress of people and animals passaging to either higher or lower elevations. Porters and old women sitting on crumpling steps talked on mobile phones, satellite dishes rested on the roofs of wooden tea-houses as children played antiquated games in the dirt and dust of time. We had a daily routine: Eat, Pray, Hike. Most days we woke up, packed our kit, ate breakfast and then hiked most of the morning. In my case I also spun a prayer wheel at every opportunity hoping that the drugs would quickly kick in to fend off my fire-breathing dragon of a toothache. At our second camp, Monjo, at an altitude of 2,850m, we had an afternoon to ourselves to relax or wander. I wrote notes in between looking up at a glacier that peeled off a jagged mountain peak. Dinner was a feast of French fries, fresh beans, carrots and chicken with Pita bread – another Master Chef winner from Yum Yum. Our group consisted of six Australians, one Brit and myself the lone Kiwi. Each day as we climbed higher the trail teemed with hikers. On one of our rest stops, Andrew from Hobart remarked, “We’ll need to indicate to get back into the traffic it’s so busy.” We then crossed over three suspension bridges above chalky-white glacial waters that roared and snaked their way over boulders and bends towards the plains of Nepal. Our lead guide was called Bebe. His favourite saying was, “Rest is best,” as we took adequate opportunity to rest our weary body parts on large river boulders worn as smooth as Tibetan silk. We arrived at Namche Bazaar about lunchtime and for added comfort stayed at the Hotel Sherwi Khangba. By this time I was doubled-over with a severe bout of ‘Delhi Belly’ and, combined with my toothache, this put me straight to bed for 13 hours. The next morning, at 8.45am, with another dose of antibiotics and Diastop tablets I was able to hike with the group to the Everest View Hotel. The exception was Maureen who by this point had caught the flu and wisely stayed in and around the village. This was an ideal acclimatisation hike to almost 4,000m and a great chance to see Everest and some surrounding peaks without a cloud in the sky. One of the challenges of altitude hiking is to get into a rhythm every morning. Stiff or not, every day for 12-16 days your legs have to support your body and backpack and the best way to do that is to set yourself a pace that suits your physical fitness and age. Back on the trail the sound of Yak bells jangled as we hiked higher. Sam from the UK casually remarked, “I might have to get the missus one of those bells so I’ll know where she is all the time.” At first the trail was leisurely but soon became steeper and stepped, zigzagging its way higher to where we spotted Himalayan Pheasant (Nepal’s national bird) and in the distance a few Himalayan Tar (Nepal’s craggy mountain goats). My breathing became heavier and heavier with my heart pounding as though about to burst through my rib cage. unfurled prayer flags fluttering in tatters. The ridge was shrouded in cloud. Inside the warmth of the tea house it smelt of smoke and charcoal as we ate lunch: a noodle, spinach and vegetable soup, curried vegetables with tinned sardines in a sauce and Tibetan bread followed by apple pie! In the early afternoon we descended off the ridge down to 3,690m and the small village of Portse Tenga. The campsite was set back from the river on an upper grass terrace with views of the valley along the opaque milky-coloured Dusa Kosi River. Mist soon started to envelop the campsite as the air turned colder and tent flaps began to freeze hard. During the day I’d developed a slight head cold and runny nose, enough to send me to my sleeping bag early. I woke after about an hour, had dinner and by 7pm returned to my tent running a fever and added more layers of clothing inside my down bag to keep warm. 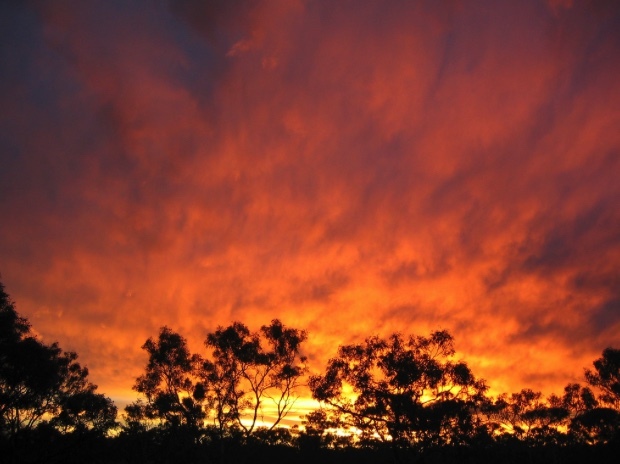 Through the flap of my two-man tent I could just see trees that were in autumn hues of deep reds, rusty shades of honey and gun smoke gray in which small birds flitted about. Only the sound of the river was louder than the noise of the birds. At this altitude I woke up regularly tossing and turning as my resting heart beat was interrupted by bouts of oxygen gulping gasps for air with my heart thumping furiously. In the morning the mist had lifted and all around were dry stone walls forming field boundaries. Many were barren or fallow, others held a few yak. The next phase of the journey would be slower. We’d be gaining altitude and it would get much harder…it was what we had come all this way for. To climb our own personal Everest, to summit the peak of Gokyo Ri at 5,340m. Shane Boocock would like to thank World Expeditions in Auckland for the outstanding organisation that went into arranging this Himalayan trek, staying in their purpose built, permanent tented camps and eco-lodges in the Solo Khumbu region of Everest. World Expeditions is one of the first in Nepal to offer sustainable, responsible travel. 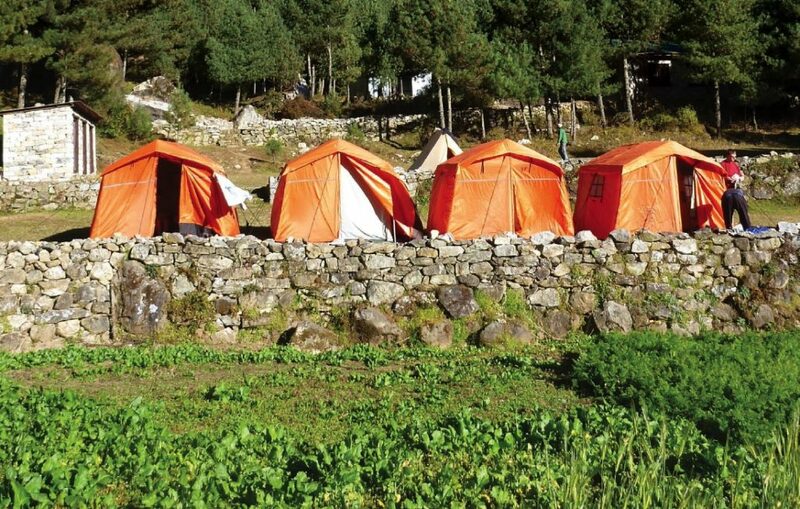 They are at the forefront of developing permanent tented campsites in the mountain regions of Nepal where they operate. It proved to be a far more private experience staying in a permanent tent site than eating and sleeping in a crowded tea-house used by other trekking organisations. By setting a whole range of new standards, there is far less chance of catching infections as they sterilise all their own equipment, plates and cutlery. Each campsite has just eight large, head-high standing-room two-people tents, each with single raised beds and mattresses. They also have purpose-built stone huts for use as communal dining/breakfast rooms, composting toilets use recycled paper and collect tank water for clients use. Permanent campsites were primarily built because severe deforestation and pollution have proven that tourism growth in Nepal can be a double edged sword. A significant increase in accommodation throughout the region has been constructed to meet the demand and they rely heavily on wood for heating and cooking for tourists. The continued use of firewood by lodges and teahouses has contributed to the thinning of forests inside, but more so outside, the national park. There are three key areas why the effects of deforestation are devastating including the major threat to the biodiversity of the regions flora and fauna, the human threat with its origins associated with land erosion which leads to landslides that have the potential to destroy entire villages and finally, deterioration in the aesthetic and cultural integrity of the region. Shane Boocock would also like to thank Kathmandu for their generous support and use of their high-quality outdoor clothing and equipment that was supplied for his trip to Nepal. T: 0800 001 234 or visit www.kathmandu.co.nz to find your nearest store. 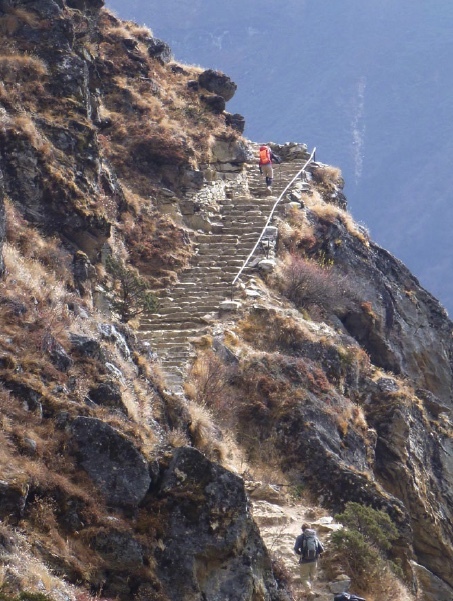 There is no easy way to prepare your body for hiking at altitude in the Himalayas – it is just plain hard graft. The best advice is to give your body and muscles a long lead-in period to prepare your fitness levels and endurance and then follow some simple rules…and stick to them!!! The older you are the earlier you should start training, especially if you sit at a computer most days and have irregular exercise routines. My hike was scheduled for November, so seven months before I left to fly to Kathmandu I started training most weekdays with a strict walking regime. Three months into it I then asked for some expert advice on what to expect at altitude. “Sounds like you’re in great shape, so just relax and take your time. You’ll adjust as you climb and get fit as you go. You’re not stupid (well…maybe a bit!) and I really think you just need to use common sense. Listen to your body. The odd headache, a tired day etc. is normal, but if it gets bad don’t ignore it.” These words of wisdom were given to me by a 30 year old female friend of mine who three months earlier had climbed to the summit of Mount Everest. A good tip for people who train in the early hours like me is to lay out your hiking gear the night before so that you don’t wake your partner or the kids as you stumble around trying to locate all your belongings. What was suitable for me might not be appropriate for other people! We all have different body clocks so fit your workouts and type of fitness training to what suits your work schedule and lifestyle best. April: In the first week of April I started out by moving from sitting in a computer chair daily and mowing the lawn on weekends to a two kilometre flat walk five times a week – total distance hiked per week 10km. May: I increased the distance to four kilometres every weekday – total distance hiked per week 20km. June: I’d moved up to six kilometres including a one kilometre long, very big hill, yet still restricting myself to five outings a week – total distance hiked per week 30km. July: To the six kilometres I added a 10km hike every Saturday morning with three steep hills as well as a 110 step stairway from my beach up a cliff face – total distance hiked per week 40km. August: I started riding a stationary bike 10km a day as well as walking eight kilometres every weekday and 10km on the weekend – total distance hiked per week 50km, total distance biked 70km. September: I was now hiking eight kilometres a day from Monday to Friday with a six kilo daypack on my back. 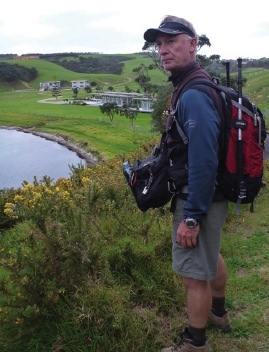 Then every Saturday I took the six kilogram daypack and added a five and a half kilo camera bag for hikes of about three hours up and down hills and costal tracks – total distance hiked per week 55km, total distance biked 70km. October: I increased my distance to 10km daily as my fitness levels and endurance began peaking especially as I was now carrying an eight kilogram daypack on my back every morning. Then every Saturday I took the daypack and added a five and a half kilo camera bag for hikes of four to five hours across undulating countryside – total distance hiked per week 70km, total distance biked 70km. In the last week of October on the advice of my Everest conquering friend I finally slowed myself right down two weeks prior to departure. Conclusion: for many people what worked for me might not work for you, some people prefer to join a gym and tap into the services of a personal trainer…whatever works best for you is what you should stick with. Just don’t take hiking at sea level and put it in the same context as hiking at altitude! The more pre-trip exercise and training you have under your backpack-belt the more enjoyable your trip will turn out to be and just as importantly the likelihood of injuries is greatly reduced.